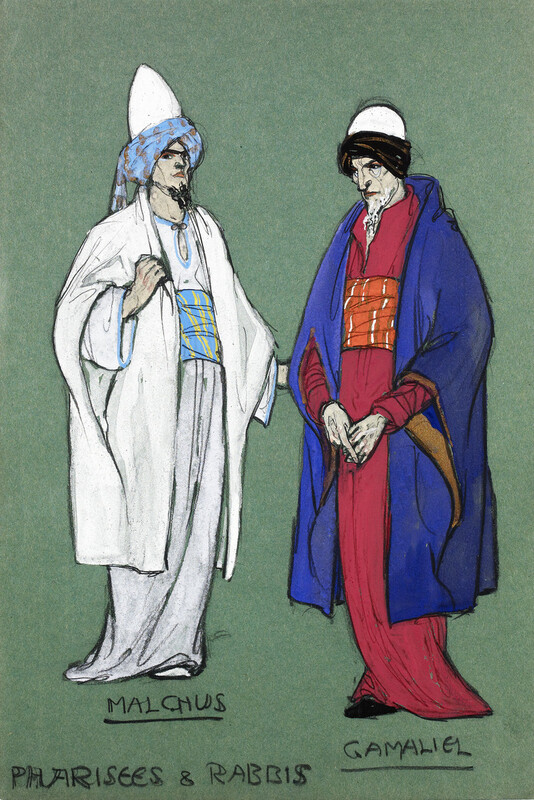 Costume design for performance of Salome. Born in Glasgow of Irish and French parentage. From 1885-1893 she attended Colonel Clark’s School, Manchester & The Manchester High School for Girls. From 1893-1897 she studied at The Manchester School of Art, under Walter Crane. From 1898-1904 she was at GSA as a student and also teaching ( from 1898-1903). She was awarded the Diploma in 1902. Classes included Stained Glass, Enamels, Illustration, Sgraffito, Gesso and metal work. From Mar-July 1903 she travelled in Paris, Italy and Switzerland visiting Studios, etc. Between 1904-1914 she worked as a theatre and costume designer in Glasgow, London and Europe. Companies included Louis Verande, Paris Opera, Granville Barker and the Quinlan Opera Company. Between 1915-1933 she returned to teach full-time at GSA concentrating on Costume, Lithography and Book Illustration. In 1927 became Head of the Pictorial Section of the School of Design and specialised in teaching Illustration. In 1933 was offered and accepted the post of Director of the Glasgow School of Art, but died (16 Feb 1933), aged 52, of a brain hemorrhage before the appointment was made public and W.O. Hutchison took up the position. Dorothy had a sister, Olive Carleton Smyth, who was also a successful professional artist and a fellow teacher at the School. She took over as Head of Design when Dorothy died. Dorothy worked as a professional artist while teaching. Her early work included the production of local plays in Glasgow, sometimes working with Charles Rennie Mackintosh and others of the Glasgow School on decoration. From the 1920s she undertook book illustrations for Chiver’s, Blackie and Collins. She worked in silverwork, sculpture (including modelling friezes and panels for the Allan Liners “Victoria” and “Virginia”). She was known as a successful portrait painter and broadcast extensively on art subjects, including art lessons for children on the BBC (as Paint Pot Pixie). Smyth also ran the Drama Club at the School between 1924 and 1933. Presented to the Glasgow School of Art by the artist's sister, Rose Carleton Smyth, in 1949.